When Will We Find a Member of Congress to Speak for Our Progressive Majority? Anyone can buy any gun at a PA Gun Show, no questions asked. Just plunk your money down. April 27, 2013 – Pennsylvania voters overwhelmingly support the extension of background checks for gun purchases at arms shows or online, similar to the measure that recently failed in the U.S. Senate, according to a new poll. While Republicans and male voters are generally less favorable to gun control initiatives, majorities in even those groups strongly supported the expanded background checks. Overall, 85 percent of those surveyed in a new poll from Quinnipiac University said they favored the background checks. 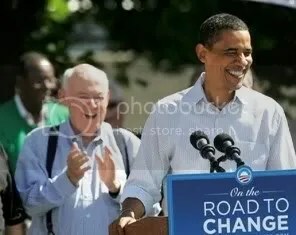 The same was true for 78 percent of the Republicans surveyed, 93 percent of Democrats and 88 percent of independents. Asked to describe their reactions to the U.S. Senate’s rejection of the measure on April 17, from a list suggested by the interviewers, 70 percent said they were either "dissatisfied" or "angry" while 22 percent said they were "satisfied" and 5 percent said "enthusiastic." Among Republicans, 10 percent said they were "enthusiastic" about the Senate action, 35 percent "satisfied," 37 percent "dissatisfied" and 15 percent "angry." Angry also was the response from 59 percent of the Democrats and 27 percent of independents. 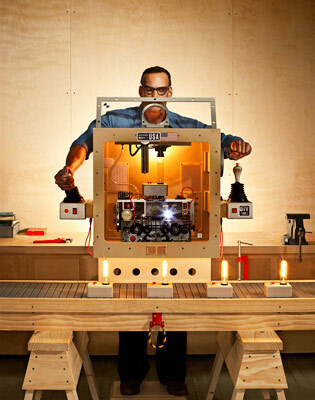 Micro Manufacturing, Third Wave Style…Perfect for Worker Coops? Jan. 25, 2010 – In an age of open source, custom-fabricated, DIY product design, all you need to conquer the world is a brilliant idea. Michael Scarnn of the Earth Quaker Action team has a discussion with a gentleman outside the August Wilson Center, the location of the PNC Financial Services Group’s annual meeting. The group was protesting PNC ‘s policy on mountaintop removal. 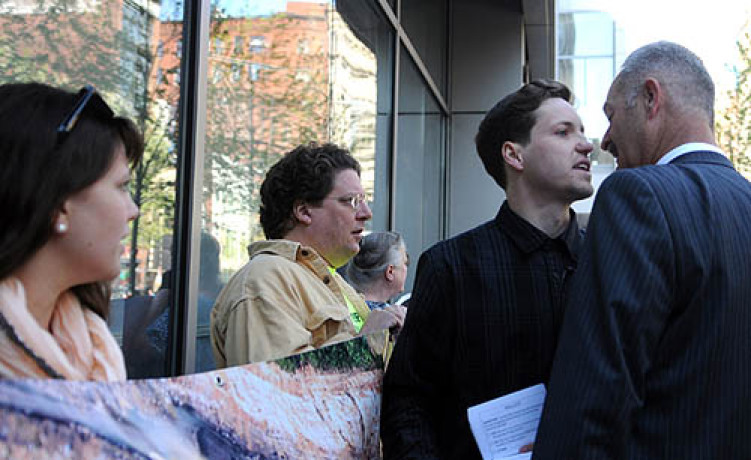 A group concerned with the environmental effects of mountaintop removal coal mining descended on PNC Financial Services Group’s annual shareholders meeting Downtown this morning, disrupting the event and forcing Chairman and CEO James Rohr to abruptly shut it down. Mr. Rohr tried to deliver his presentation inside the August Wilson Center, but was repeatedly interrupted by members of the Earth Quaker Action Team who took turns calling out the names of individual board members asking them to state their position on mountaintop mining. After calling the protesters out of order, Mr. Rohr essentially threw up his hands and adjourned the meeting roughly 15 minutes after it began. 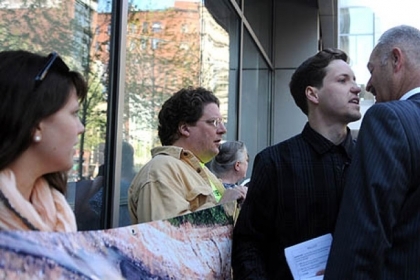 Earth Quaker, which has demonstrated at PNC’s annual meetings for three straight years, wants Pittsburgh’s biggest bank to stop lending money to companies that extract coal by shearing off the tops of mountains. PNC last year said it no longer financed companies with a majority of their business tied to the practice. But Earth Quaker executive director Amy Ward Brimmer said today that no companies fit that description. “None of them do a majority of their business in mountaintop mining,” she said. The group claims PNC remains one of the nation’s two largest financiers of mountaintop coal mining. Ms. Brimmer said members decided to step up pressure on PNC this year because executives have refused to meet with them. “This is the only way we can think to get their attention,” she said. This article was published in partnership with GlobalPossibilities.org . 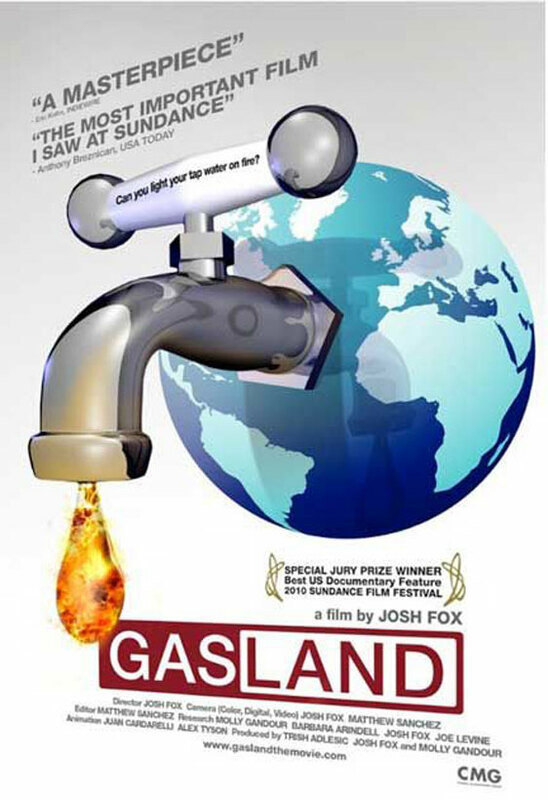 April 22, 2013 – Gasland Part II, which premiered at the Tribeca Film Festival on Sunday, takes us deep into the heartland of America, a land overtaken by gas extraction via fracking. The iconic and recurring depictions of water-on-fire seen in the first Gasland, in the new film serve as postcards from a travelogue through a land of broken promises, abandoned homes, and extinguished rights. The first Gasland, (which was released in 2010 and nominated for a 2011 Academy Award) became this country’s wake-up call about fracking, the first prod for millions to look beyond the industry-engineered PR facade. Banjo music played throughout the soundtrack revealed director Josh Fox’s chosen musical instrument. But Fox became a kind of Pied Piper for a growing grass roots movement that questioned the need for fracking. Challenging the inroads claimed by the multinational gas and oil industry, fractivism is a popular and youth-driven pushback that these powerful industries are neither accustomed nor equipped to deal with. Gasland and Gasland Part II (and films like them) unmask the human debt incurred by an array of corporate Goliaths. It turns the lens on those joining the ranks of the Davids—ordinary citizens that awaken from the American dream to discover their way of life has been redefined by impersonal corporate entities, intent on constructing new superhighways towards profits‑—right over the lives of tens of thousands of people. Gasland Part II continues Fox’s exploration by offering textured, in-depth profiles of half a dozen or so families in geographically diverse locations, from Australia, to Wyoming to Pennsylvania. Fox’s camera takes us into the homes of straight-talking folks who worked hard to secure their corner of the heartland. April 15, 2013 – Ed Wade’s property straddles the Wetzel and Marsh county lines in rural West Virginia and it has a conventional gas well on it. “You could cover the whole [well] pad with three pickups,” said Wade. And West Virginia has lots of conventional wells — more than 50,000 at last count. West Virginians are so well acquainted with gas drilling that when companies began using high-volume horizontal hydraulic fracturing in 2006 to access areas of the Marcellus Shale that underlie the state, most residents and regulators were unprepared for the massive footprint of the operations and the impact on their communities.